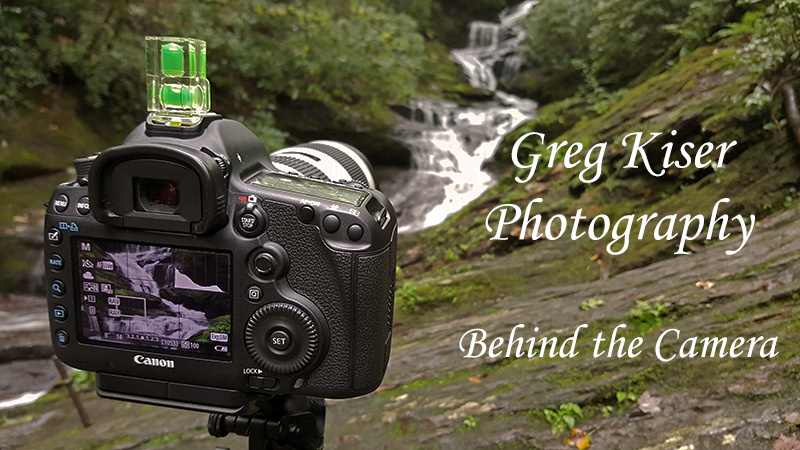 Welcome back to another installment of my monthly Behind the Camera feature. In this feature, I try to give a little insight into my photography by answering a question that has popped up during the previous month. This month's topic comes from Beth Reed through Facebook. 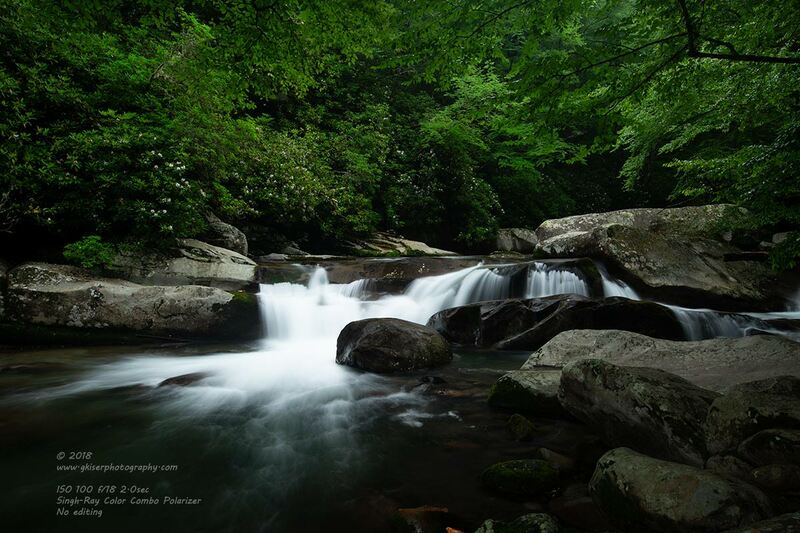 The question she posed is: How do I get that look with my waterfalls, where the water looks "thick" and blurry? That effect has also been called "milky" in several of the comments I've seen with my waterfall pictures. This question came at a really good time since I have recently been to two different locations for waterfalls. 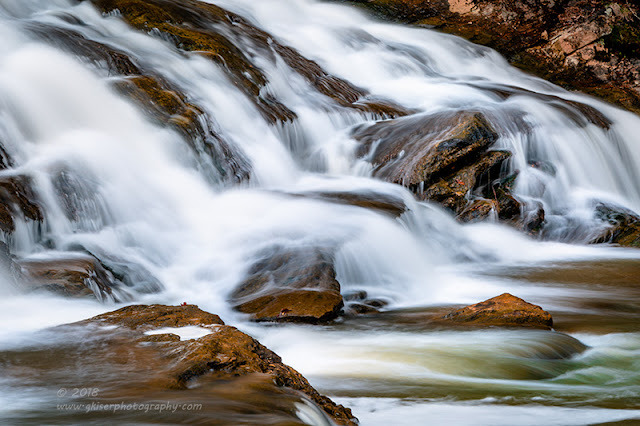 Big Creek and Roaring Fork Falls are some of my favorite places to go for moving water photography. I had also done a couple of videos specifically dealing with how I captured moving water. So, thank you Beth for suggesting this topic. There is a huge division out there on how best to photograph moving water. In one camp, you will find a group that likes a fast shutter speed which freezes the motion in the water and shows the detail down to the droplets as they move over the obstacles. In the other camp, you will find those which prefer to slow the shutter down and create a motion blur with the moving water that results in the silky look. For those of you who have viewed my White Water Gallery Room here, you will know without a doubt which camp I fall in. Yes, I like milk spilling over my rocks, and I don't cry about it either. So, how is this look achieved? It all comes down to having a long exposure which is very dependent on the light falling on the scene. 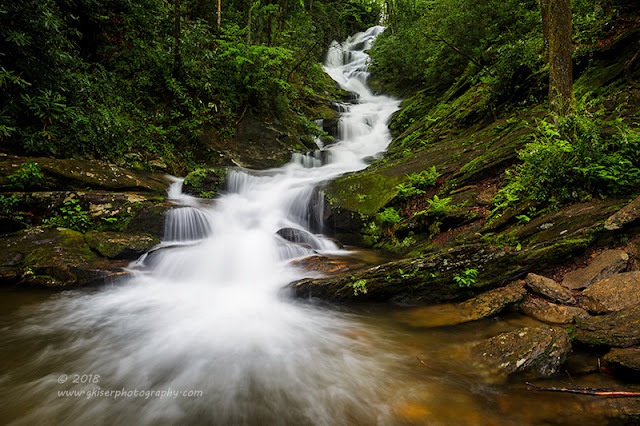 For the most part, I much prefer cloudy days for waterfall photography because it limits the light that is available and it reduces the highlights as the sunlight comes through the trees. This starts me out with a great advantage for capturing these scenes. It still doesn't get me all the way there though. Lets take a look at this one video that I shot a few weeks ago at Big Creek which talks a little about one of the major filters that I use with this type of photography. 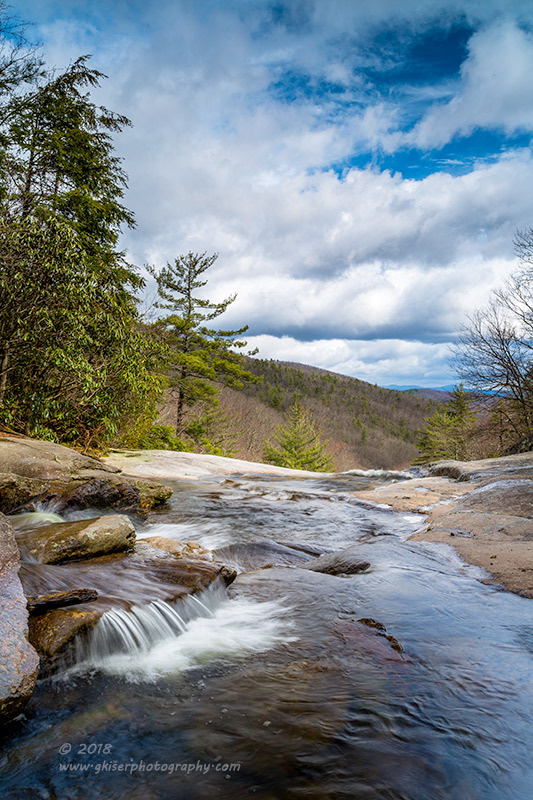 A polarizing filter is probably the most important part of photographing water, moving or otherwise. A good quality polarizer will make a world of difference in your photographs because of one simple fact. This filter will remove glare from water particles which is arguably a good portion of your composition. With the glare removed, the colors are more saturated, and you can actually see beneath the surface in many cases. This benefit will expand to the surrounding elements in your composition as well such as foliage as they have a certain water content in the leaves. The polarizer will add to the saturation in your greenery as well. I've done a quick comparison shot of the scene that I shot the video of to illustrate this concept. In this shot, I set the camera for a proper exposure without any filters on the front of the lens. I set it up as I would with a filter with the exception of the shutter speed. F/18 was plenty for the depth of field that I wanted here, and the meter ended up suggesting a shutter speed of 0.4 seconds which was not enough to really blur the water like I would want, but more importantly, there is a lot of glare on the surface of the water, as well as the wet rocks. It is not a bad image, but the water looked a little too chaotic for my tastes. When I added the Color Combo Polarizer, my exposure immediately darkened due to the reduced light entering into the lens. I kept all of my settings the same with the exception of the shutter speed. Allowing for a proper exposure based on the meter and histogram, I slowed the shutter to 2 full seconds still at f/18. That is a huge difference with just a single filter being added. You can see the that the glare is removed, which yields a darker scene overall. The rocks near the white water are now rendered dark without the glare from the spray. Even the greens are saturated now as the glare was removed from the leaves. Keep in mind that both of these images are straight out of the camera with no editing except for the resizing for posting here. These are the RAW images that I captured. There are instances where I need a slower shutter speed than I can achieve with a polarizer alone. In these situations, I will add a Neutral Density Filter which has a sole purpose of reducing the light that enters the lens. If it is a good quality filter, there will be no color shift once it is added. I find that when shooting on very overcast days an ND filter is not needed. The key settings here are to shoot the image with your lowest ISO, which in my case is 100. I could go down to 50, but that actually degrades the quality of the image slightly and introduces a bit of noise as it is a product of internal manipulation on the part of the camera. You can only access this by unlocking the feature in a menu. To maintain the highest quality image, I leave it at the native low ISO of 100. I also keep the lens stopped down a good bit for depth of field when shooting any landscape, but for waterfalls, the narrower the aperture the better. I try not to go all the way to the narrowest aperture as diffraction becomes an issue. In these images, f/18 works well (f/22 is the highest aperture for the lens). Diffraction is a byproduct of a very narrow aperture where you actually start to lose sharpness throughout your image while maintaining a wide depth of field. Some images can handle diffraction better than others, and lens quality has a lot to do with the degree of diffraction. The idea behind all of this is to reduce the light that enters the lens to allow for a slower shutter speed. In the case of the aperture, it is a double benefit since you get more depth of field with the narrower aperture as well as the ability to use a slower shutter speed. The only negative to a very narrow aperture is that you will absolutely have to use a tripod for your waterfall photography. There is no way to hand hold a camera at 2 seconds and keep the image sharp. A tripod will also allow you to repeat the composition with different shutter speeds to see what you like the best. 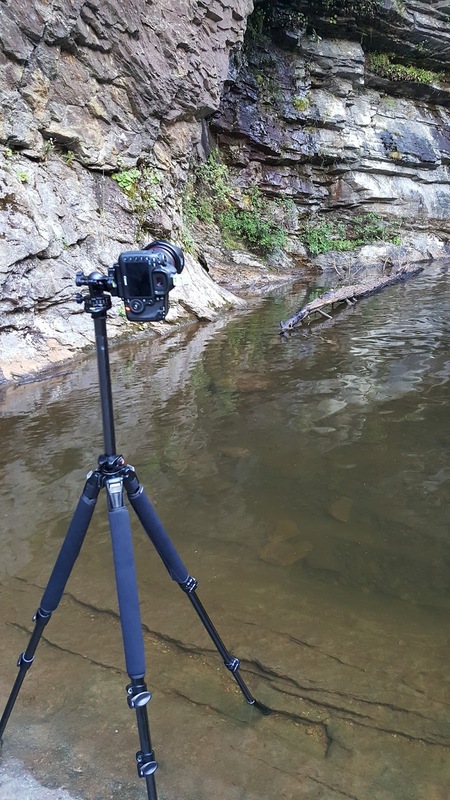 Of course, I recommend a tripod for all of your landscape shots because you are assured to get a stable and sharp image the vast majority of the time. You just have to be careful not to bump the tripod with your feet. To take full advantage of a tripod, I would also recommend using the mirror lock up feature and either using a remote release, or using the self timer (2-seconds) so that your image doesn't suffer from the mirror flipping up and causing a slight vibration. Here we have the final image after some editing in Lightroom. This is where the beauty of RAW comes into play. You can see what I started with in the above comparison shots. There was a good deal of contrast in the scene and not much was in the middle tones. By bringing out the details in the image, I was able to get details under the water's surface, in the cascades of the water, and on the rocks themselves. The greenery also comes alive. The process here took about 5 minutes to do, and required nothing out of the ordinary from any other digital negative that I have shot. There was only a small amount of cloning done on the bottom of the frame as there were some distracting bright rocks at the bottom edge of the frame that wanted to pull your eyes away from the scene. This pretty much covers the how behind my water photography, but why is it I like this milky presentation so much more than a fraction of a second shot? Simple...I love seeing the patterns that the water reveals as it moves. When you freeze the shot, the patterns are lost in the chaos of the flow. By slowing the shutter down, you are no longer looking at the droplets, you are looking at how the water deals with obstacles in its path. That is part of the power behind water, and to me, the beauty of it. 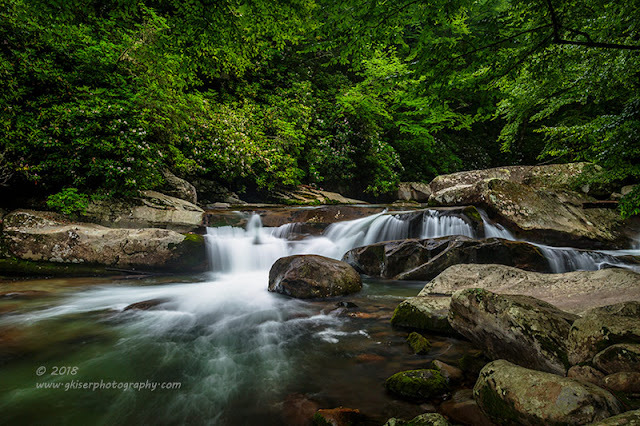 In this shot of Mouse Creek Falls, I isolated the flow of the water to show the patterns and textures that I am talking about. To really accentuate those qualities, I stripped the color from the image and added a bit of contrast. You can spend a lot of time looking into this image and picking out abstract designs, and even a face or two. 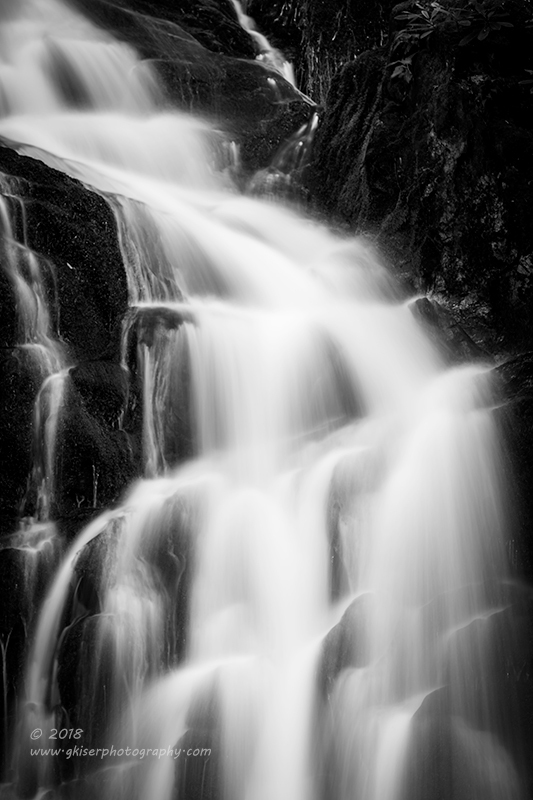 The slow shutter simplifies the motion, and makes it almost melodic in nature. That is completely missed with a snapshot of moving water. Don't get me wrong, I don't dislike those freeze frame water shots. I have seen several that were absolutely beautiful. I just don't look at them for long at all. Almost as quick as the camera was exposed, my eyes lose interest because there are no patterns to pick out. I look, I appreciate, I move on. When I look at a long exposure waterfall, I will stop and look at it much longer. I start to really look "into" the photograph. I become emotionally connected. It is no longer a shot of a specific waterfall, it is a piece of art that is to be appreciated. When it comes right down to it, I think that all photographers can agree that the idea of an image is to prompt involvement from the audience. 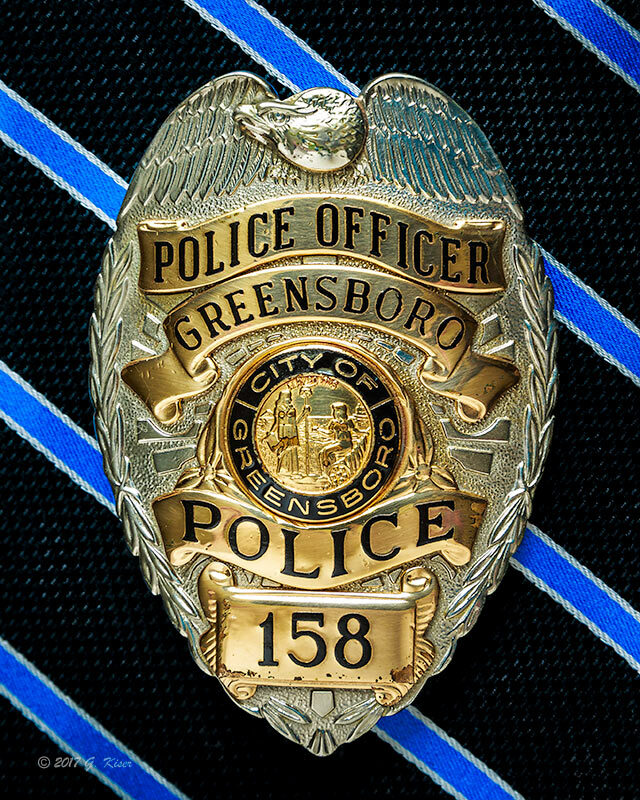 We want people to look, to study, to consider, and ultimately to react to the image. In order for that to happen, there has to be something to draw you in. When we look at a waterfall in person, we are seeing the water moving somewhere in the area of 1/60 to 1/125 of a second (estimated as our eyes don't have a shutter speed). This would be a typical exposure on a sunny day. By slowing the shutter speed, we are essentially creating the look of movement which gives life to the water and allows us to imagine seeing the motion which can't be captured except for video. It makes it more interesting to see, and will prompt the viewer to examine it closer. There is one major pitfall that we haven't discussed yet when it comes to these long exposure shots. We have the camera set up on the tripod, we have our polarizer and maybe a neutral density filter attached. Using our remote and the mirror lock up we are all set for a great long exposure of moving water at 3.2 seconds. But wait, if we are using a long exposure to capture motion, would it not stand to reason that the breeze blowing around might cause motion in the greenery? Yep, when you are shooting a long exposure, you will capture any movement as a blur, and that includes branches and leaves. There is no cure for this (outside of a multiple shot that blends elements) other than waiting for the wind to die down a bit. I have stood patiently for 15 minutes or more waiting for a lull in the wind before releasing the shutter. It also pays to take several shots of the same thing on breezy days because you will then have several to choose from to see what blur you are willing to live with. Now that you are comfortable shooting waterfalls, you can use some of the same concepts with other landscape shots that include moving water. 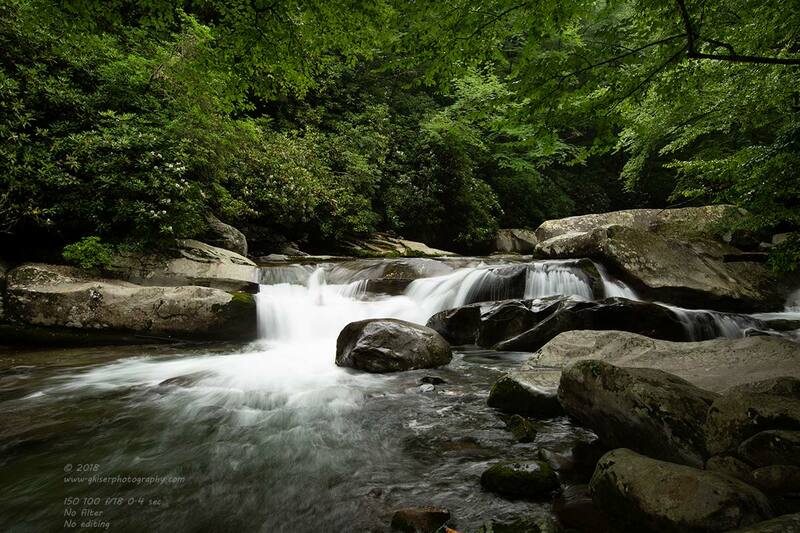 take for example, this shot from the top of Upper Creek Falls in the Pisgah National Forest. The main focus here is the sky and the landscape in general. The visual anchor is the small cascade, less than a foot tall in the foreground. Had I shot this at a normal shutter speed (a fraction of a second), I would have lost a lot of the visual impact of the small cascade and it would not have worked nearly as well as an anchor. By slowing the shutter speed using a polarizer, and a couple of ND grads (5 total stops of light loss), I was able to get the exposure to around 1 second. It wasn't much, but it was enough to get the effect I was after. There are, of course, exceptions to my methods of photographing waterfalls. There are times where a faster shutter speed is much more appropriate. 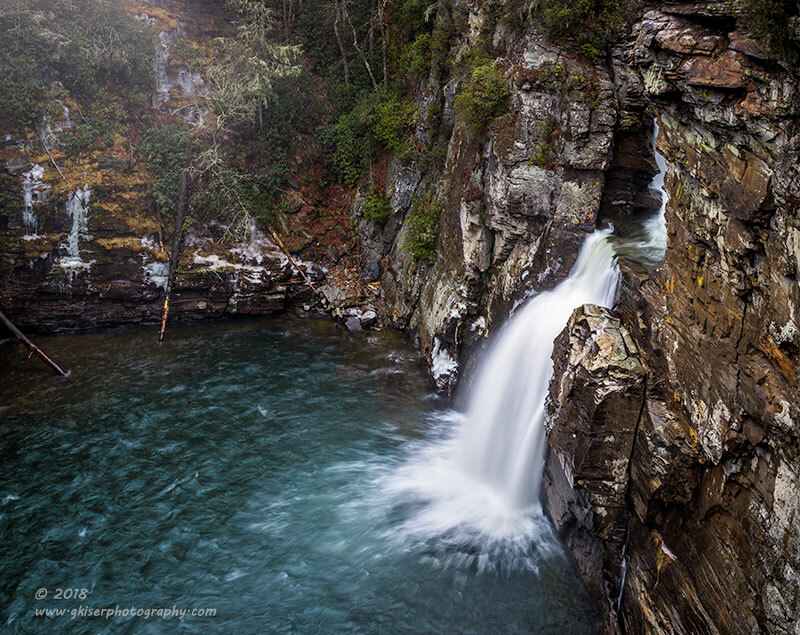 For instance, this shot of Linville Falls was done using a shutter speed of under a second. I could have easily gone longer based on the lighting conditions, but I've found that any time I photograph this kind of volume spilling over rocks that too long of an exposure loses the detail in the water that I am after. The water is fast enough that even a fraction of a second will render this very silky. I've done Linville with 2 second exposures, and even longer in the past and it just turns into a white blob with no character. By speeding it up a touch, I still keep the details and excitement. Water slides are another time where you don't want to blur the water too much. With this image of High Shoals Falls, the way the water moves over the rocks leaves very little detail to be picked up. 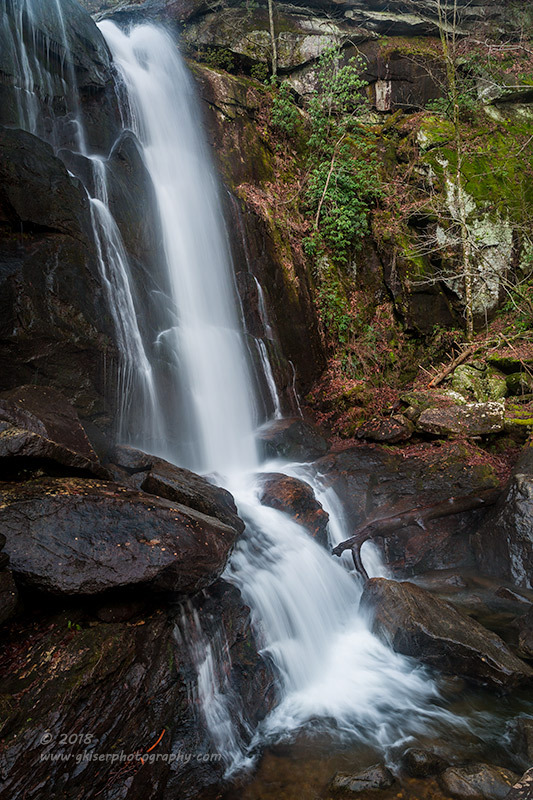 As with the previous image of Linville, less is more with your exposure. I shot this one a just under a second. The water flow was quick enough that I didn't need much exposure time, and this still allowed for some detail in the water, while rendering it silky smooth. These are just some considerations while shooting waterfalls, and you can always allow more might into the camera by opening up the lens (lower f/number), or changing the ISO to make it higher. You do still want to use a polarizer as the removal of glare is very important for this type of photography. After your exposure, check the image on the LCD review and zoom in. While it won't be an exact representation of the captured image, it will give you an idea if you got the effect right. As with everything in photography, season to taste. there might be a time when you want just a touch of glare to make a rock stand out, maybe you want things to be a bit darker than they actually are. You are the photographer, you make the decisions on how your images are captured and then presented. Thanks for the topic Beth! 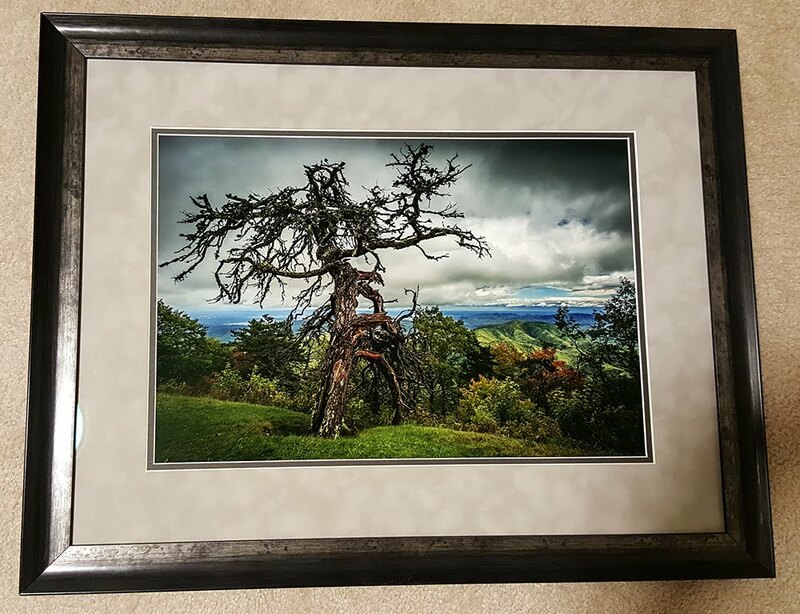 Remember if there is ever anything that you would like to know more about with my photography, just ask. Your question might just be the next Behind the Camera topic! Fascinating. Always amazed at how much goes into a picture. Enjoy your photography so much and thanks for using my question for this "behind the Camera" topic! Thank you for the topic, and you are right there is a good bit that goes into a photograph most of the time. This is just the surface of it all. I'm glad you enjoyed it, and thanks for the kind words about my photography in general. I really appreciate it!